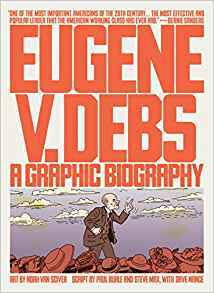 The colourful Eugene V. Debs would make a wonderful subject for a graphic novel but unfortunately, this is not the book I’d recommend. There are passing references, largely uncritical, about the Bolsheviks and their American supporters. A not insignificant part of the book focusses on American socialism post-Debs, showing Norman Thomas as a rather nice old man and Michael Harrington in a very critical light. The authors’ political agenda is evident on every page, but the real Eugene Debs does not come alive here. A pity — this was such a great idea for a book.